Have you ever been downstairs at the Milwaukee Art Museum? If you haven’t, next time you visit the Museum, walk by the contemporary art, as if going towards the Warrington Colescott exhibition. On the way, you will find a staircase punctuated by a hypnotic video drawing you downstairs. There you will find the interactive Chair Park made up of various reproductions of historical chairs, which you can sit on, relax, and experience fully as you converse with others sitting around you. You will also find the Word Cloud, a social tagging experiment that asks you to describe three seemingly disparate pieces with one word. Continuing east, you will come upon a small installation titled The Body Politic. 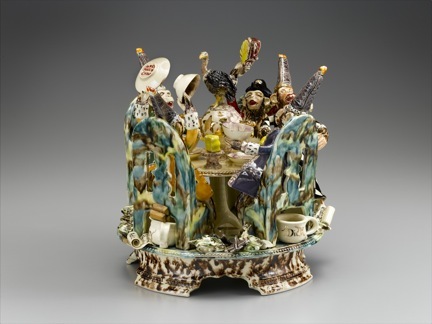 The six ceramic works on view were created by Virginia-based artist Michelle Erickson. Erickson spent 25 years of her career studying archeological fragments and rediscovering 17th- and 18th-century ceramic techniques. She not only faithfully reproduces historic objects (she was commissioned to make a piece for the Queen of England to commemorate the 400th anniversary of the founding of Jamestown), but also uses historic forms and techniques to comment on contemporary social and political issues. Michelle Erickson, Texas Tea Party, 2005. Chipstone Foundation, Photo by Gavin Ashworth. Although small, compared to the wonderful furniture pieces sitting high on pedestals nearby, the works in The Body Politic warrant a close look, as they are full of meaning and irony. For example, Texas Tea Party is based on the popular 18th-century Staffordshire figural groups. At first glance, it appears to be a whimsical version of these groups, which were often depicted in conversation, or drinking tea or punch. Erickson, though, transforms the original expressionless figures into an animated parody of George W. Bush and his administration. Upon a closer look, one notices that there are chamber pots underneath the seats the monkeys sit on, and every chamber pot bears a name, identifying its sitter. The figures wear oilrig hats and drink a black substance from their teacups, referring to one of the driving forces behind the administration. President Bush wields a teapot shaped like the “Shell” logo, giving us a clue to the sweet crude’s source. The monkeys appear joyous and oblivious, drunk with power, while gold bricks fill their chamber pots. Texas Tea Party offers a strong commentary on the relationship between money, oil, and power. The other five works in the installation offer similarly strong, and at times humorous, narratives dealing with issues such as the blood diamond trade, child soldiers, and global warming. Erickson’s pieces are beautifully made, intriguing, and powerful. 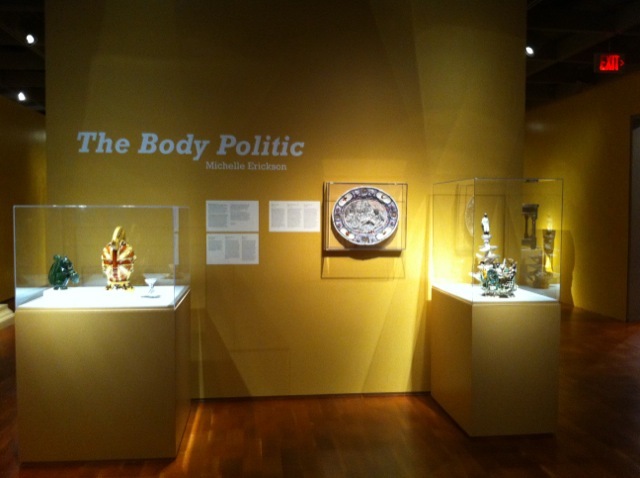 The Body Politic runs through January 17, 2011. This entry was posted in Curatorial and tagged Chipstone Foundation, Decorative Arts, Michelle Erickson. Bookmark the permalink.